Don’t you hate it when you go to the doctor and show up a couple minutes before your appointment time, but then you still need to wait for a half hour or more? Isn’t that the whole point of setting an appointment time – so that you don’t need to wait when you get there? While you’re sitting there in the waiting room twiddling your thumbs like a chump, it’s hard not to feel like the doctor thinks they’re better than you. At the very least, you don’t feel respected. Your customers feel the same way when you show up late. This is not just some minor annoyance – keeping your customers waiting can be absolutely fatal to your business. If your driver shows up late, the customer’s going to get upset. If the customer gets upset, they might leave you for one of your competitors. Worse yet, they might go online and leave you a bad review. That’s terrible for your reputation. These days, no one picks up a phone book when they need something. No, they go online, look at all the available options, and see what other people think. Negative online reviews have a huge effect on your bottom line. According to a Vendasta report, 51% of consumers will only patronize a local business if it has positive reviews, and 86% of consumers hesitate before using a business that has negative reviews. Make no mistake – upset a customer, and there’s a good chance they’ll stop using your business and start using another (according to a study conducted by Oracle, 89% of consumers that start using one business did so after abandoning another business because of poor service). Losing one customer isn’t that big a deal, right? The problem with losing one customer is that you lose a resource that could have earned you many more customers. People who are satisfied with your business will recommend you to their friends and family – these personal referrals are much more effective at attracting new customers than print, radio, and television ads. According to the New York Times, 65% of new business comes from referrals. The University of Pennsylvania’s Wharton School of Business reports that the lifetime value of a customer that was earned through a referral is worth 16% more on average than a customer that wasn’t earned through a referral. If you upset a customer and they decide not to be your customer anymore, they’re obviously going to stop referring you to others. So, word-of-mouth marketing is much more effective than traditional print, radio, and television ads. It’s even more effective than internet advertising. But those other methods are still pretty effective. That’s why people pay for them. They’re less effective, though, when you can’t manage to show up on time. A customer that only stays with you for a month or two won’t help your business that much. And when they leave because they’re disappointed with your performance, they’re going to spread the word about how bad your business is. No amount of ads will allow you to overcome a bad reputation. When you plan routes manually, it’s hard to live up to the ETAs you give your customers. Traffic, weather, construction, and other factors get in the way. You don’t need to plan routes manually. Instead, you should use route optimization software. Route4Me’s route planner accounts for all those aforementioned factors. It can generate 100% accurate and optimized routes for you in 30 seconds or less, no matter how many stops you need to make. Our route optimization software guarantees that every route you give your drivers is the most efficient route possible. That makes it much easier for your drivers to show up on time. And Route4Me is automatically updated to reflect current road conditions, so you’ll be able to avoid sudden traffic jams. Of course, optimized routes won’t do you much good if your drivers don’t follow them. You can’t physically see your drivers when they’re on the road and you’re at your office. How can you be sure they’re following their routes? Route4Me’s GPS tracking feature allows you to see what your drivers are up to in real-time, so you can make sure they’re always doing what you want them to do. What if, at the last minute, a customer requests that you deliver a package to a different address? You’d need to throw out your old route and start from scratch if you plan routes manually. There likely won’t be enough time for you to do that, so you’d be forced to tell the customer that you’re just not able to handle their request. They won’t be too happy about that. With Route4Me’s route optimization software, accommodating last-minute requests is easy. Just change the address, and our program will have your new route ready for you in less than 30 seconds. Route4Me is synced to your drivers’ smartphones, so every change you make to a route on your office computer is instantly shared with the driver that needs to see it. Another situation that can potentially delay a package is when you need to make a delivery to a large complex that has several entrances, like a hospital. Free mapping software like Google Maps will show you which address to go to, but it won’t help you out if there are multiple points of entry at that address. Your driver will be forced to waste time circling around as they try to figure out which entrance is the right one for them. 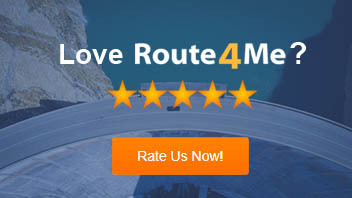 With Route4Me’s route optimization software, you can make notes inside routes that other users can review later. You could tell drivers exactly where they need to go in this hospital scenario. There’s no need for your driver to circle around, and the package can be delivered on time. So, do you see how route optimization software improves driver performance and customer satisfaction? Have any questions? Let us know in the comments section below.